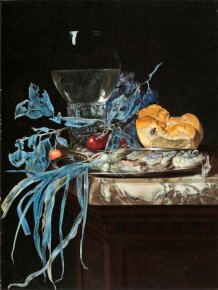 1/11/12 - Acquisitions - Montreal, Musée des Beaux-Arts - We had already begun to publish (see news item of 29/5/12) the extraordinary donation of 70 old master paintings made to the Musée des Beaux-Arts in Montreal by Michal and Renata Hornstein. In that same article we provided a brief list of the artists represented and reproduced four works. 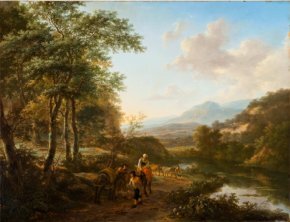 Here are eight more, all by Dutch artists, as Northern European art predominates in this collection. Two are 17th century Dutch still-lifes. The first is by Willem van Aelst (ill. 1). Strangely enough, the alteration of the pigments which affected the painting  by transforming the greens into blue probably added to the fascination of the work. The way in which the plants, now blue, stand out against the stark black background, create an absolutely remarkable plastic effect. Still-life with Herring, 1666 ? The second was painted by Abraham van Beyeren (ill. 2). 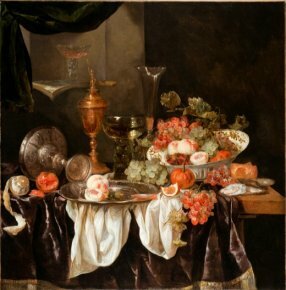 Rich and subtle, much larger than the previous one, this work presents a very complex composition where the fruits and opulent dishes are seemingly scattered about in what is in fact a perfectly structured layout. After the still-lifes, we have three landscapes. 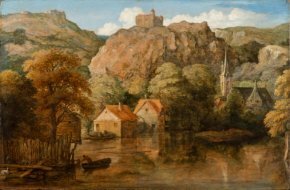 The first is by Allart van Everdingen, the brother of the more famous Cesar van Everdingen, and a student of Roelandt Savery. The latter’s influence does in fact appear in the mountainous landscape (ill. 3) donated to the museum, imbued with a certain naiveté which accounts for its charm. While the Allart landscape falls entirely within the Northern European tradition, the same cannot be said for the one painted by Jan Both (ill. 4) in 1648 (there are only three signed paintings known today, including this one). The artist spent some time in Italy between 1638 and 1642 where he worked alongside Claude Lorrain who marked all of his works even after Both returned to Utrecht, his home town. The painting in the Hornstein collection provides us with ample proof, showing a certain affinity with the works of Italianate Northern European painters such as Hermann Swanevelt (whom he knew) and Nicolas Berchem. 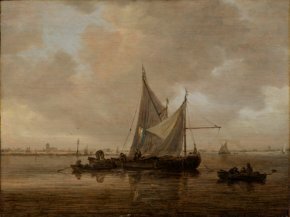 The third landscape is actually a Marine by one of the great specialists of the genre, Jan van Goyen (ill. 5). It represents sailboats with a view of Dordrecht in the distance and bears his monogram with the date of 1642 (or 1643 ?). We continue with genre scenes and two very different examples. 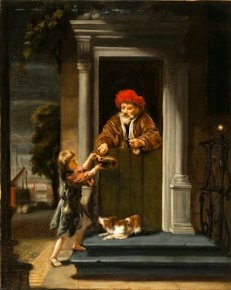 The first is by Nicolas Maes (ill. 6) and comes very close almost to a historical painting with a scene of an elderly man giving alms to a young child which seems drawn directly from the Bible. The work does in fact have a religious connotation since it is no doubt an allegory of Charity, one of the three theological virtues. This is the third work by the artist to join the Musée des Beaux-Arts in Montreal which already owned an Adoration of the Shepherds and the Portrait of Paulus van Esch. 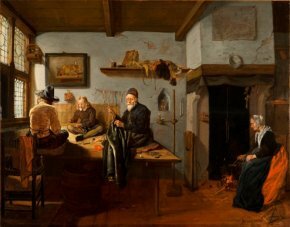 The second genre scene is by an artist from the Leyden school, Quirijn van Brekelenkam ; it shows the Interior of a Taylor’s Workshop (ill. 7). This painter specialized in representations of craftsmen’s workshops, treated much in the same manner as Pieter de Hooch, with the same taste for detail. We would like to close this news item on some of the paintings from the Hornstein donation with a historical painting by Cornelis van Haarlem representing The Hesperides Filling the Horn of Plenty (ill. 8). Although the artist’s production was mainly Mannerist, this work produced relatively late in his career (it bears his monogram and is dated 1622) shows that his style evolved towards a more Classic manner. According to the entry provided by the museum : "The artist, employing sophisticated techniques to produce a myriad number of greens, used a generous quantity of "ultramarine" which when exposed to light, resurfaces over time."